The first thing that comes to mind when I hear cognac is a certain large scale brand, that is popular with the hip hop set. You know the drill, they spend a ridiculous amount of cold cash for table service at a Miami nightclub. Here’s what I know about Congac: I know that cognac is a brandy, made in a specific region of France. I also know that I’ve had a few delicious examples after some rather decadent French meals. But, that is about all I know about cognac. Why am I telling you this? Well because I want to learn! After all, Cognac is made from wine, and so I really should include it in this wine blog, as I explore all wine regions and try to understand more about the different aspects of distilled spirits made from the grape. I’m also telling you this because the Cognac Board is holding a contest to send some lucky bloggers to tour the region, and I’d love to go learn more about this particularly unique piece of the world. The specific region where Cognac is made in France is actually the town of Cognac. Not to be confused with another region nearby that also makes brandy, a distilled brandy calling itself Cognac must be made from specific grapes grown in specific places distilled by specific people. I think they might be Oompa Loompas actually. The Cognac region is located on the western center edge of France, spreading out in to the coastal towns. I don’t blame them for needing brandy! It gets COLD there! The most commonly used grape is Saint Emilion, aka Ugni Blanc. What the heck is Ugni Blanc? Apparently this white grape is also known as Trebbiano and Thalia, and is actually the most widely planted grape in France. Mind you, most of the wines made from this grape are distilled in to industrial alcohol but well…The other grapes allowed to make the brandy are Folle Blanche and Colombard, but you can eye of newt, and up to 10% of Folignan, Jurançon blanc, Meslier St-François , Sélect, Montils or Sémillon. Right, so the only grape that I know in there is Semillon. Time to get studying! The brandy part of Cognac is made by doubly distilling the white wines made from the grapes mentioned above. The wines start out as very dry, acidic and frankly undrinkable, but by the time you distillit down, it’s nectar. The first fermentation results in this dry white wine, with only about 8% ABV. Now the magic happens. Place said wine in a beautiful copper pot still. Distill. Twice! The result is a clear brandy that is about 70% ABV. How about that firewater kids! To get the amber silk that is Cognac, the brandy is then distilled in oak casks. Over two years, the angels get to imbibe in about 3% a year (the Angel’s Share is the amount of wine or other liquid hooch that is lost due to evaporation). Those must be some very happy angels! It takes about 5 years to reach the 40% ABV that is the end goal, some of the lowbrow producers can cheat a bit by adding water to the brandy. Not so great, but it speeds up the process. But wait! We’re not done! 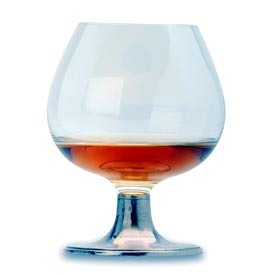 Cognac is blended beverage. That means that these single malts (ok fine I know they aren’t a malt but well it’s so much like the whisky process that this is what works in my wine blogger head) need to blended with other barrels. Single Cognac Lot 12A meet Single Cognac Lot 45A! He’s hot, isn’t he? Now, like Vinnie, blend! It’s the lucky job of the master taster (maître de chai), to assist in this marriage contract and blending. By now, I am getting thirsty. Are you? There are so many grades of Cognac, much like Scotch whisky. From the ordinary to the grande dame, you can get everything in between. What’s better? What’s worse? I don’t know. I am going to do some research to see what I think. I wonder if airport bars have a decent selection. Have a great Cognac Cocktail recipe? Please share it in the comments! Perhaps a Cognac Sazerac? Cognac Manhattan? Mmm that sounds good. I better get to stocking up the bar this weekend!